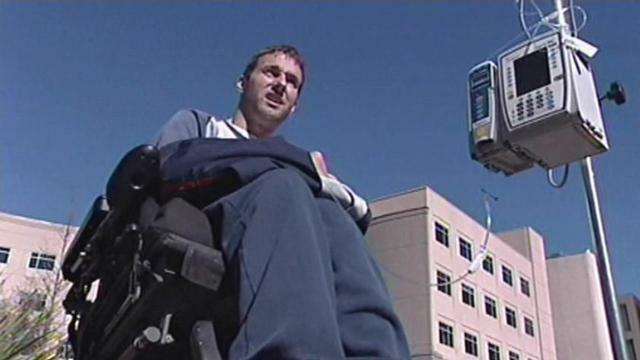 JACKSONVILLE, Fla. -- This isn't the life 32-year-old Shane Downey pictured for himself 9 ½ years ago. Back then he was an athlete and he loved gymnastics.But one bad landing after a double backflip on a piece of gymnastics equipment stopped all competition for Downey and left him paralyzed. "There was no pain but everything was gone," Downey said. "I live a life but it's completely different now. "Downey said it happened while he was helping out a coach at a local gymnastics center.He was asked to try out the Tumbl Trak, which is like a long, narrow trampoline.During his move something went wrong. Downey crushed his spinal cord. Mitch Woodleif said. "They did not do any supervision whatsoever. They didn't say, 'Stop.' They didn't say, 'Don't do that kind of pass.' They didn't say anything. "Downey said the money from the lawsuit won't give him his life back.In fact, most of it will just go to pay his mounting medical bills and the ones that are still to come. Downey's attorney said the family has faced $3 million in medical bills already. "Pretty much the only thing I can do on my own is eat and move around in my chair," Downey said. "I mean, I have to have someone around to help me get dressed and to change clothes and to help me go to the bathroom and take a shower and go from one place to the next. And I mean, you lose a lot of dignity whenever you can't do things for yourself." SHINER – Shane Mikel Downey, 34, died Wednesday, May 11, 2011. Service was 3 p.m. Saturday, May 14, at Thiele-Cooper Funeral Home with Bishop Russ Parker officiating and interment at Shiner Cemetery. Visitation was Friday evening at the funeral home. Pallbearers are Pecos Downey, Trace Downey, Kyler Downey, Bill Daniel, Lee Mack Turner and Jesse Downey. He was born March 1, 1977, in Channelview, Texas, to Mikel and Carol Turner Downey. He was a coach and judge for NBTA, USGF and AAU and a member of The Church of Jesus Christ of Latter Day Saints. Shane always found a way to have a smile on his face and a smile in his heart no matter the circumstance. He is missed. Survivors include his mother, Carol Downey-Daniel and husband, Bill Daniel, of Shiner, Texas; father, Mikel Downey and wife, Dee, of Mineral Wells; sisters, Tina Noa and husband, Jim, of Iola, Texas, Amy Downey, of Houston, and Rebekah Downey, of Shiner; brothers, Pecos Downey, of Austin, Jesse Downey, of Mineral Wells, Trace Downey, of Austin, and Kyler Downey, of Shiner; grandmothers, Frances Turner Powell and husband, Milton, of Yoakum, Texas, and Billie Lois Downey, of Graham, texas; and stepsisters, Steveanna Nunley and Jane Nunley. He was preceded in death by grandfathers, H. Lee Turner and Hollis Edwin Downey; uncle, Charlie Ray Downey; aunt, Lois E. Turner and cousin, Danan Burns. Memorials may be given to the Christopher Reeve Foundation. Online guest book may be signed at www.thielecooper.com. Copyright 2011, Mineral Wells Index / Community Newspaper Holdings, Inc. (CNHI). All Rights Reserved. as is usually the case, the media has it all wrong. He was a liar and incompetent schmuck who did a skill he had done dozens of time in that gym then blamed everyone else when it turned out he was never properly trained to do it. he was never a gymnast, never a qualified coach or athlete and his injury was all is own fault. Roll a mile in his wheelchair/life and then decide if you might sue.